"The most widely used strategy guide and reference resource for buying a UK business"
According to industry statistics, over 90 percent of the people who begin the search to buy a UK business fail to complete a purchase. There were several common reasons given by those who failed to realize their dream of business ownership: most were first-time buyers and admitted to having totally underestimated just how much was involved with each stage of the buying process. They felt overwhelmed and ill prepared to handle all of the new situations and major decisions they encountered. Business ownership can prove to be one of the smartest investments you'll ever make. However, if you want to be certain you are successful, just like anything else, it is imperative that you are properly prepared and equipped with the right information in order to make all the right decisions along the way. Everything You Must Know Before You Buy A UK Business. How To Buy A Good UK Business At A Great Price© is "the most widely used and successful strategy guide for buying a UK business." This is not a simple, generic introductory 'book' on the subject. It combines critical knowledge and proven techniques for each stage of the process and every situation you'll encounter, along with expert ongoing consulting. 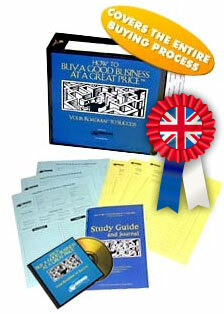 This program is specific to the UK market. It incorporates all of the key information you need to know. The strategies to follow and the resources to use when buying a business in the United Kingdom. If you're serious about buying a business, and especially if you've never bought one before, you've arrived at this Website because you want to have the right information and access to unbiased, expert advice to be absolutely sure you make the right decision. How To Buy A Good UK Business At A Great Price© is based upon hundreds of business investigations and successful transactions in every field, including manufacturing, retail, a huge array of service-sector companies, the food industry, and wholesale and distribution businesses. This material contains over 500 pages of proven, simple-to-follow strategies, legal agreements, interactive resources, sample letters, case studies, financial spreadsheets, worksheets, and business plan templates. Buying a business in the UK is not as common as you might think. The popular, but riskier option is to start a business. This flies in the face of logic when you consider that you could buy an existing business with strong cash flows, existing customer and supplier bases, motivated employees, and a presence in the local market. This is why banks are often more prepared to lend for the purchase of a good business. But beware - it can be a complicated and time-consuming process that is fraught with difficulty. So you need to be prepared! A diagrammatical road map included in the materials provides a clear, concise, step-by-step guide to the UK business buying process. Negotiation - Price is just one aspect of the transaction to be negotiated. Terms are just as important, particularly something as simple as what is included in the sale and what's not! The materials will explain exactly what you should do for every important clause and deal point. Heads of terms - Also known as 'heads of agreement', this process is where you set out the main terms of the sale. It enables you to describe the agreement in principle, before due diligence and drafting documents has begun. You will learn precisely what should be included and how to structure each aspect of the deal. Valuation - The worth of a business can be measured objectively, but in the end is determined subjectively (i.e. how much are you prepared to pay?). Use an array of proven techniques you can deploy to value a business, including asset valuations, Price Earnings (P/E) ratios, discounted cash flow valuations, and other relevant techniques that make sense for each particular enterprise. Due diligence - Here you will find techniques on how to make sure you are getting what you thought you were buying. You'll know exactly how to uncover any problems BEFORE you buy! Sale and Purchase Agreement - You've satisfied yourself that this business is right for you and that you can finance the purchase. The vendor has accepted your terms. Now the deal needs to be documented in a sale and purchase agreement, based on the Heads of Terms agreed upon earlier in the process. This is the most important document in the transaction, so make sure you know what should be included. Post-completion - To maintain a business's momentum it is essential that the transition with the owner takes place as smoothly as possible. Learn how to do this effectively. There are many places where you can find listings of UK businesses-for-sale, some more reputable than others. This guide tells you where to go to find the best sources of listings. Or find out how to approach sellers directly and discreetly, often a fruitful way of achieving your goal. Searching can often prove time-consuming, so make sure you find out how to save your valuable time! You'll be reading this UK companion alongside the main course, so here's some guidance as to how buying a UK business may have its own aspects to consider. There's regulation, tax, law, fees, and property details to consider, plus lots more. How much does the UK agent charge? What government funding grants are available to me? What's the difference between buying a freehold property or leasehold? Navigating the tax minefield. In this section you will also learn about the operational aspects particular to UK businesses: collecting income tax on behalf of your employees, employment law, and managing your finances, are just some of the areas covered. Unlike the US, bank lending is very common in the UK. Learn how to be prepared BEFORE you visit your bank manager. Leigh is the Chief Operating Officer of Vitesse Media plc, publishers of the Lloyds TSB Small Business Guide (which has sold over 1.5m copies), the Website SmallBusiness.co.uk, and Business XL, the magazine for growing businesses. Leigh was previously a consultant with Deloitte & Touche and CEO of www.BusinessesForSale.com , the global Website that connects buyers and sellers of businesses. Leigh has reviewed the UK guide. "Whenever I meet a budding entrepreneur, I'm often asked the best way to start or grow a business. I suggest, sometimes controversially, that buying a business is a good way to success. Why start up when someone has probably been there before you? Buy the customers, the cash flow, employees, goodwill, etc. It will save you months, if not years of development. But there is a catch; it's rarely easy. Many transactions fail and some buy the wrong businesses or pay the wrong price, which can have enormous personal consequences. That's why anyone who's serious about buying a business must be prepared. In my experience there's plenty of free, general information around, but very little good quality advice. Most articles you'll find are written by sellers or a seller's adviser - beware! You are the buyer, you are paying the cash, and you are taking the risk. You need the best guidance and advice available. This is why I'm so delighted that Richard Parker has compiled this UK business buying guide to accompany his course on How to Buy a Good Business at a Great Price. He writes for the buyer. He's independent. He doesn't get paid a commission and he provides first-class customer service. I'm confident that the UK market will benefit significantly from his guidance through this UK guide - and so will you." Focusing Your Search: You'll learn where to look, the specific UK resources to use, and how to focus your search like a laser beam on businesses that make sense for you. Instead of wasting time searching endless business for sale listings trying to figure out which ones might be right, you'll refine this process to quickly identify prospects that fit your specific criteria. We'll show you how to get immediate replies from brokers and other intermediaries so that you can devote your time to locating the right business instead of chasing people for information. The Ten Commandments - what every good business must possess: This is huge! Our clients rave about this section because you'll learn the ten most important factors that every good business must possess. Presented in a simple format, it is the ultimate test to apply to any business for sale you're considering to quickly determine whether or not it's worth pursuing. After thousands of business purchases we know precisely what the common ingredients are in every good business! These ten components have proven over and over again to be the foundation of any good business. Using Transfer Agents and Intermediaries: Most buyers don't realize that transfer agents represent the seller and not the buyer. They're paid a commission by the seller and so their mandate is clear: get you to buy any business for sale, not necessarily the right one. Why use them altogether? They serve two purposes: they can be helpful in providing you with access to businesses for sale and they're the ideal liaisons to deliver any bad news to the seller in order to preserve your relationship, especially if the seller will remain on board after closing to train you. But, it's important that you engage the right one. You'll learn how to check them out and get them to show you listings that are "reserved" for others. How To Flawlessly Investigate Any Business (this is crucial! ): Every business for sale has secrets that the seller does not want you to discover. You'll know how to uncover everything about any business before you buy! Your investigation must be flawless and it must begin the moment a business is of interest as there is so much to cover. You'll receive our 200-point Due Diligence Checklist & Strategy Guide that is beyond compare and goes way past the financials to show you precisely how to investigate absolutely every part of the business, the competition, the suppliers, the customers, the contracts, the employees, legal issues, the industry, and on and on. Negotiating The Deal and Making An Offer: Our program will prepare you to effectively negotiate every part of the deal. There are over 50 specific clauses that must be addressd, and this is what separates good deals from bad ones! We provide you with "what to do" checklists and point-counterpoint strategies for each component you'll have to include in a Purchase Agreement. We'll lay out the precise clauses you'll need to ensure you're completely protected from a future decline in the business, purchasing bad inventory or equipment, or for any other liabilities that will surely come back to haunt you if you don't protect yourself properly. Closing The Deal - Making The Final Decision: How to add up all of the information and make the right decision. You'll know what issues have to be renegotiated, and the documents needed to close the deal. Post-Purchase Priorities: The first 90 days after you own the business are so important; you'll have a bulletproof plan to operate for the first three months covering every important aspect of the business. You'll have a step-by-step plan of what you must accomplish with the seller during training, how to be certain they are totally cooperative and how to get them to stay on if necessary or be available to you in the future for any questions you may have. You'll know how to effectively communicate your vision to the employees and how to set your plans in motion to begin to take your good business and make it great. The UK guide is structured in a way as to make it easy to read, quick to digest, and instantly memorable. - The best Websites, trade publications, newspapers, and other resources to find the right UK business. - All of the unique issues particular to buying a business in the UK. - A comprehensive section that provides links, and contact information of organisations that can help you with your purchase. After you receive your material, simply follow the techniques we've laid out, utilize our consulting service as often as you'd like, and if, for any reason whatsoever, you feel that the information we have provided does not equip you with all of the knowledge and tools you'll need to buy the right business for sale, or if our program does not exceed your expectations in any way, just let us know at anytime and we'll immediately refund all of your money. This is not a 30-day guarantee with all kinds of hidden conditions. No questions asked! No fine print! After you confirm your order, you will receive a receipt for your purchase containing your link to retrieve your download immediately after you confirm your order. Study Guide and Journal© - To track your progress, note key points to remember from each section, and log any questions that you'd like to discuss with us.